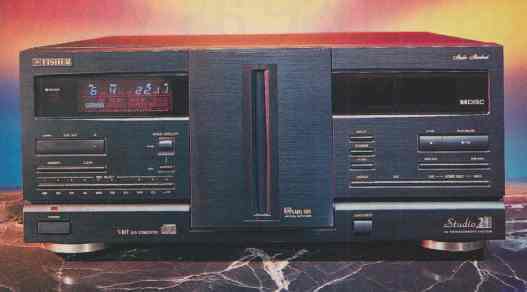 Compact disc changers have be come extremely popular since their introduction. The first changers used removable magazines holding six to ten discs, and, with the almost simultaneous development of home and car models, they enabled convenient swapping of magazines between home and automobile. The next step was the home carousel changer, holding up to six discs on a rotating platform that turns to place a disc on the playing spindle. The simplicity of the carousel mechanism has made these products competitive with medium-price single-play models. Considering that they do not sacrifice any significant aspect of audio performance, the great popularity of carousel changers is not surprising. In June 1992 we reported on a hundred-disc changer, a pricy unit de rived from professional CD “jukebox” designs. Now, several new CD changers also offer enlarged disc-storage capacity but at more affordable prices. 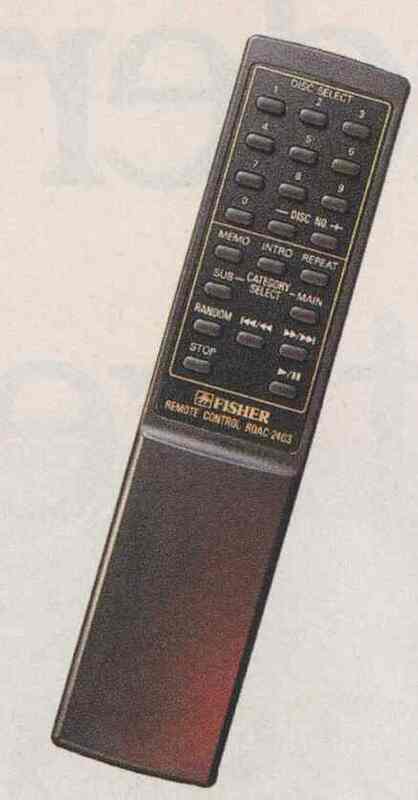 Among them is the twenty-four-disc Fisher Studio 24 CD Management System (known more formally as the DAC-2403). The Studio 24’s mechanism incorporates a nonremovable rotating magazine with slots for twenty-four standard-size CD (3-inch CD’s, even with adaptors, cannot be used). The discs are loaded, one at a time, through a vertical slot in the front panel that is normally closed but opens at the touch of a button. Because of the vertical disc orientation, the Studio 24 is considerably taller than ordinary CD players or changers. Its appearance is not unlike that of a rather large A/V receiver, although it is comparatively lightweight. The left third of the panel contains the display window and a number of buttons, principally for disc selection. The window shows the usual information, including the current disc, track number, index number (displayed but not cueable), and playing time (which can be switched between elapsed and remaining time on the track or disc). The Studio 24 also offers a means of classifying the discs and displaying this information in the window. It has seven built-in music categories, designated as Rock, C/W (country-and- western). R (rhythm-and-blues), Jazz, Easy (easy-listening), Show (show tunes), and Clas (classical). The appropriate designation can be assigned to each loaded magazine slot and will then appear in the window when the disc in that slot is selected for playing. You can also create and store your own category names of up to eight characters. In addition, an eight-character subcategory name can be assigned to each slot and stored; like the main category, it is displayed when that slot is selected. The Studio 24 changer provides many of the popular playback modes of conventional CD players, including intro-scan (playing the first 10 seconds of each track), random play (of both disc and track or just among the tracks on a single disc), a combination of intro-scan and random play, and multiple repeat modes (one track, all tracks on a disc, all discs, or all discs in a selected category or subcategory). You can also program the Studio 24 to play, in any order, up to forty-eight tracks from as many as twenty-four discs. The right third of the front panel resembles the left side, including a symmetrically placed window that has only a cosmetic function. The internal light lets you see the disc tray spin around, but only from up close because the window is darkly tinted. This portion of the panel also contains the conventional transport buttons (fast forward or reverse, track skipping, and so forth). The rear of the player has only the stereo analog audio output jacks and the line cord. The Studio 24 comes with a small and uncluttered remote control that duplicates all the regular operating functions, including disc selection. Programming, however, can be done only with the front-panel controls. The technical specifications for the Fisher Studio 24 changer indicate only that it uses dual 1-bit digital-to- analog (D/A) converters with eight times-oversampling digital filters and that it has less than 0.03 percent total harmonic distortion (THD) at I kHz and a signal-to-noise ratio (S/N) of 100 dB. In our measurements, it met or surpassed these specifications, al though it produced lower than average performance in some other characteristics, sometimes because of its higher than normal ultrasonic noise and distortion levels. The Studio 24’s measured frequency response was flat within +0, -0.1 dB from 10 Hz to 9 kHz, with a rolloff to -1.9 dB at 20 kHz. De-emphasis error was a maximum of -1.1 dB at 16 kHz. The linearity of the D/A converters at low levels was excellent, as in most other 1-bit designs. Dynamic range and interchannel phase shift were both fine. Other measurements showed average performance when the inaudible contributions from ultrasonics were filtered out. Finally, the player’s speed (pitch) error of +0.33 percent was the largest we have measured from a CD player. Since this amount of error will cause an hour-long CD to finish nearly 12 seconds early, we consider it excessive (even an inexpensive record player— remember turntables?—has better speed accuracy than this presumably crystal-controlled CD player). Fortunately, all of the changer’s mechanical and operating features worked properly, so we were able to exercise and appreciate the versatility of this unusual product. Loading and unloading discs is easy and foolproof, for example, and actual operation of the Studio 24’s playing functions is straightforward. Moreover, all the operating features are thoroughly and clearly explained in the instruction manual. There is a lot to learn, however, and if you are serious about using the player’s considerable programming flexibility, be prepared to spend some time studying and even practicing the procedures. Fisher has wisely adopted a policy used by many computer hardware and software manufacturers, providing a toll-free phone number that you can call if you have any difficulty operating the player. Despite the slight deficiencies we found in its measured performance, the Fisher Studio 24 CD changer produced good, listenable sound. As it happens, most compact disc specifications (like frequency response and channel separation) are many times better than they have to be for first- class sound reproduction, so a failure to meet the highest level of measured performance really should not automatically disqualify a player from consideration. The Studio 24 combines the sonic performance of an average-quality single-disc CD player with the exceptional versatility provided by the twenty-four-disc changer mechanism. One should also bear in mind its low price, which would have been unimaginable not long ago. I see a nice market niche for the Studio 24 in the small-business environment, such as a dentist’s office, where all-day back ground music is required and where its random-programming capabilities would provide a “turn on and listen” source of background music at a minimal cost. As a home component, it looks to me like a rather specialized product, albeit an excellent value.